Water consumers will face a hefty estimated charge of $8 billion to safely remove asbestos piping being used in Australia, according to the nation’s peak water industry body. About 40,000 kilometres of water pipelines contain asbestos cement that is starting to wear out, the body said. It is not widely realised that many of Australia’s water pipes were made by Australia’s biggest asbestos manufacturer, James Hardie. “Hardies had a number of factories around the country that just made pipes and they were predominantly used by the different water companies around Australia,” said lawyer Tanya Segelov, who is a member of the council for the Asbestos Safety and Eradication Agency. The Water Services Association of Australia told 7.30 some of the pipes are coming to the end of their useful life. “So water utilities are monitoring how those pipes are working, how they are holding up,” the association’s managing director Adam Lovell said. The pipes are located all over Australia but they are most concentrated in regional areas, where sometimes up to half of all water pipelines are made with asbestos cement. There is no evidence the pipes can cause cancer by drinking water from them, but there is a potential danger from dust when the pipes are disturbed. To fix worn-out pipes is a major expense. “We estimate that just to rehabilitate all of the asbestos cement pipelines out there is in the order of $8 billion,” Mr Lovell said. “You don’t necessarily want to go rushing out and replace it all, either. Photo: Trevor Grant is still not sure exactly where he received the exposure that’s now killing him. Trevor Grant, a well-known former sporting journalist for The Age and The Herald and Weekly Times newspapers, has recently developed the asbestos cancer mesothelioma. He was shocked to discover it might have come from exposures in the newspaper buildings where he worked. “There were pipes that I discovered that were regularly cleaned in The Herald building that contained asbestos,” he said. Mr Grant believes the relevant authorities need to raise much more awareness of this particular disease. “There’s asbestos all around us. There are people from all walks of life who are going to continue to suffer,” he said. Support groups around the country are furious at what they see as a muzzling of the Asbestos Safety and Eradication Agency by the Federal Government. 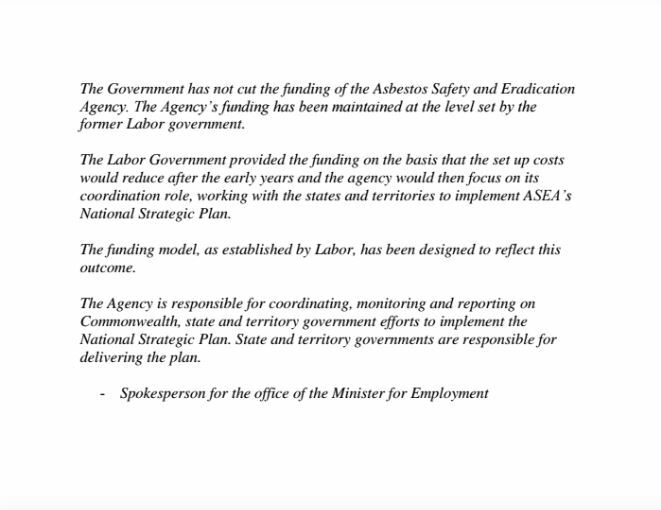 In 2013, the Coalition supported Labor’s establishment of the independent Asbestos Safety and Eradication Agency (ASEA) to do just that — promote awareness of asbestos hazards and to coordinate a national response. Since its inception ASEA has dealt with a wide range of asbestos issues, from the Mr Fluffy housing contamination to the continuing illegal importation of asbestos products from China. “We have the Telstra pits, we see illegal dumping stories about asbestos every week,” Ms Segelov said. It took a year to get state and territory governments to sign on to the ASEA’s strategic plan, during which time the agency’s budgeted $3 million remained unspent. That is $3 million the agency now cannot access. “It’s like an episode of Yes Minister,” Ms Segelov said. Activists are frustrated and angry. “Victims support groups right across this country campaigned for over 12 years to have this agency put in place and now, to strangle it on the vine, so to speak, with a lack of funding, it’s criminal,” Asbestos Diseases Foundation of Australia president Barry Robson said. Employment Minister Michaela Cash was not available for an interview. In a statement, her spokesperson denied the agency’s funding had been cut. She refused to comment on the $3 million underspend, saying the agency’s funding had been set by Labor. 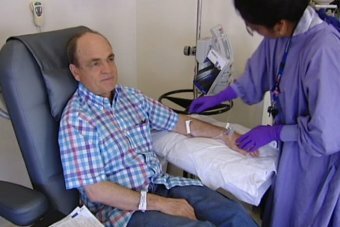 Reporter Matt Peacock has been paid by ASEA to facilitate its international asbestos conference. Posted on March 29, 2016, in ConspiracyOz Posts. Bookmark the permalink. 1 Comment.